Pneumonia is one of the most serious and relatively common diseases. It results from inflammation of the pulmonary parenchyma. Pneumonia is the most dangerous for children under five years of age. Statistics indicate that this disease is the most often cause of death of children in this age range. There are many classifications of lung inflammation, starting with bacterial, viral, ending with hospital ones. However, in each type it can be observed that pulmonary alveoli which are filled with air, on X-rays have inflammatory infiltration. 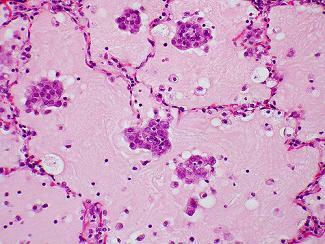 The disease is usually caused by diplococcus. This microorganism is responsible for 70 percent of all cases in people, who are not staying at the hospital. The risk of pneumonia contamination is the highest for infants and people over 65 years of age. Also, alcoholism, malnutrition and cigarette smoking may affect the disease. There are several factors that may contribute to pneumonia. First, immune disorders such as diabetes or HIV infection. Second, skin and mucous membranes damages, such as long-term bronchitis. Other diseases, including respiratory system or kidney disorders may also have an impact on developing pneumonia. Typical symptoms of pneumonia are: weakness, muscle pain, high fever lasting longer than a week, chills, cough, difficulties with breathing and traces of blood in the saliva. During the medical examination bronchial murmur is observed, and blood tests show elevated ESR, CRP and WBC, and sometimes anemia. Treatment of pneumonia is based on antibiotic therapy. Additionally analgesic, antipyretic, expectorant and antitussive medicines are used in order to eliminate troublesome symptoms. However, if complications of pneumonia occur, hospitalization is required. This applies especially to children and elder people, for whom the consequences of the disease can be life threatening. In the hospital, the patient is under constant observation and is treated with much stronger medicines. The treatment takes about three weeks.